Ghana’s sole participant at the 2018 World Choir Games, The Harmonious Chorale, has been crowned as World Champion in Pretoria, South Africa. The choir won the newly-created category C28 during the second awards ceremony held on Friday at the Moreleta Park Church. This is an open repertoire at the championship level of the World Choir Games. In the first awards ceremony held on July 7 at the Sun Arena, Harmonious Chorale Ghana picked up three gold diplomas; emerging as the overall winner in one of the categories from the open competition. After this sterling performance, the choir received a recommendation to participate in the Category C28 of the championship competition. The choir emerged as the overall champion in the category scoring a total of 90.75 points out of 100. 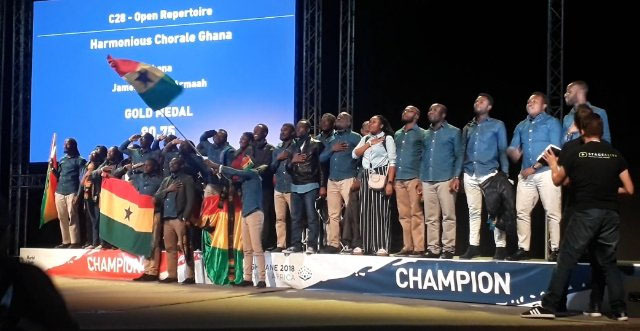 This accolade by Harmonious Chorale at the championship level is something Ghana should be proud of, especially when the National Anthem was played in honour of the achievement. Under the directorship of James Varrick Armaah, Harmonious Chorale presented a 52-man team made up of 44 singers, four keyboardists, two trumpeters and a sound engineer, Dominic Ansa-Asare of MiDo Productions. The World Choir Games, which was organised by Interkultur, is the largest choral event in the world, with the idea based on the Olympic Games ideals, which aims to peacefully unify people and nations connected by songs in a fair competition. The 10th edition of the competition took place in Tshwane, South Africa from 4 to 14 July, the very first time the event has been held in Africa. A total of 300 choirs from over 60 countries participated the World Choir Games 2018. In another related development, the principal organist of Harmonious Chorale, Augustine Sobeng, and two trumpeters of the choir, Patrick Agbodza-Gbekle and Timothy Nyante, have been billed to perform with the orchestra during the closing ceremony of the World Choir Games to be held at the Sun Arena on Saturday, July 14. Harmonious Chorale Ghana is the resident choir of Salt & Light Music Ministry headed by Rev Dr Joyce R. Aryee.